The Hulk, although it is a tough decision because Superman would be fighting under the yellow sun. He's one big solar battery but there is the potential for him to exhaust his cells (energy cells) and he would have to retreat. The Hulk, as previously mentioned would keep getting stronger and stronger the more pissed he gets, an example of his power when hes truly pissed would be : http://en.wikipedia.org/wiki/World_War_Hulk Also, even if the Hulk had to retreat as previously mentioned to transform back, the moment Banner would be in trouble, he would instantly transform. Like 10 seconds, a smirk appeared as the sound got a little louder. Thanks for sharing. The Killers, they are currently my favorite. And I would like to thank the people who replied to this thread, I was able to catch some new bands I haven't heard of so cheers. I have a couple of CD's on my computer that I haven't listened to in awhile, I had it on shuffle and caught some tracks from Blink 182. The party song, is currently my jam. Its an oldie but goldie. Its been a dream of mine to attend an oilers game in the arena, I watched a few videos on youtube of the whole arena singing the Canadian anthem. I am from Winnipeg, so it was great when we got the Jets back. 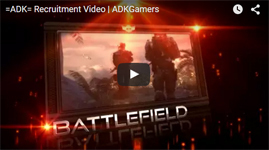 Hello, my name is Peter and I play on the ADK servers for Battlefield 3. I joined the teamspeak channel for a bit one afternoon, will go back tomorrow. I am currently applying to be a member of ADK, I never joined a gaming clan like this before and just recently got into PC gaming. Well, I can normally be found on BF3 ADK TDM cuz its my favorite server. Anyway, I hope to see you in game. Take care and thanks for reading!